Globally, consumers are throwing away US $460 billion worth of clothing each year1. This shocking statistic was quoted in a report released last year by circular economy experts, the Ellen MacArthur Foundation. Last month, the Ellen Macarthur Foundation announced a collaboration with the Cradle to Cradle Products Innovation Institute, to provide innovators and designers with information on safe materials usage during the design process, such as those that are chemical free and can be upcycled. The information is featured in the Circular Design Guide; a guide for designers and innovators to contribute to a new wave of textile design. 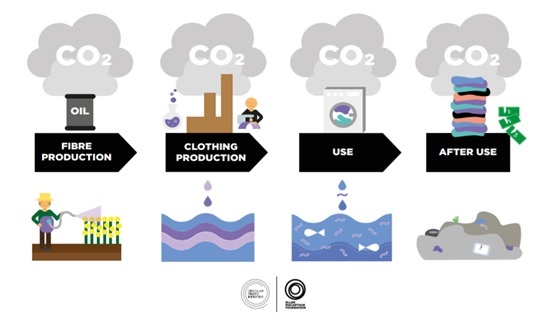 These processes work by promoting safe closed-loop textiles and upcycling, and will assist in solving some of the most prevalent environmental implications, such as microfibers and polluted water sources, that exist within today’s contemporary fashion industry (Figure 1). Figure 1: The social and environmental implications of today’s fashion industry. Technology. The use of tech in design is helping to make seamless connections between suppliers, designers and customers. Li & Fung’s virtual 3D design platform, does just that. By creating a demand chain, partnering with companies who create electronic copies of garments to make sure the products made are those the customer wants. 3D sampling cuts processing time from weeks to days, creating less waste and saving on transportation and carbon costs. Education. As an estimated 80-90 percent of the environmental and economic impact in a product will be determined by the designer. Teaching designers, students and educators the importance of the power of design in reducing textile waste in garment production. Through industry engagement, consumer campaigns and awareness, Redress is working to promote the uptake of designer education, through initiatives such as The Redress Design Award, which recognises talent around the globe who promote the circular fashion economy in their designs. Optimisation and innovation. Negative environmental and high financial costs persist throughout supply chains. Excess sample creation and high product return rates are some aggravating factors. Alvanon address this issue by working with key players in fashion, such as Adidas and Gap, to streamline the ways that retailers and brands manage the design/production processes and communicate across produce development, from design to textile sourcing and final production. The outcome; reduced waste, time and resources. Companies. Providing care labels on garments is no longer enough for a market of increasingly concerned consumers who want to know the origin and manufacturing practices for their goods. In our digital world, consumers can share and become instantly connected with a tribe of like-minded individuals on social media. Brands that are not practicing sustainability are at risk, from those who wish to hold brands accountable. To create responsible and transparent value chains, companies should not only be proactively engaging with suppliers to assess risk, willing to work with them to improve sustainability practices. They should also be willing to finance necessary changes to progress towards sustainable development. Government. Government can help by funding initiatives and supporting sustainable fashion. In recent years, the demand for green products in Hong Kong has risen, reflecting the increasing social and environmental consciousness of the city. Hong Kong Research Institute of Textiles and Apparel (HKRITA), a government led initiative to advance sustainable fashion research, has carried out 170 projects, costing upwards of HKD$500 million. As part of a multi-stakeholder collaboration, HKRITA, the H&M Foundation and Novetex, have opened Hong Kong’s first textile upcycling factory, which will create recycled yarn out of discarded clothes. To understand more about sustainability opportunities in your apparel supply chain, contact CSR Asia and ELEVATE for a range of solutions from Assessment and Consulting to Programs and Analytics. Our services create impact and positive, lasting change. 1. Calculation based on Circular Fibres Initiative materials flow analysis (for details see Appendix B) and Euromonitor International Apparel & Footwear 2016 Edition (volume sales trends 2005–2015). In 2015, 46% (in mass) of collected garments were reused. If 100% of discarded clothing were collected, 22.2 million tonnes would be reused instead of 5.6 million tonnes as at present, meaning 16.6 million tonnes of new garment sales would be avoided, with a value of USD 460 billion.